Dragon #6 is a big, bad, burly male. Name That Dragon! Yesterday's winning name was "Fionix Princess of Thunder" named by Rob, who named it through commenter John Ferguson, who's comment backstories have been really spectacular. Make sure to check those out. My daughter took the judging lead on this one, she REALLY liked this name, and I agree--it's a great one! Honorary mentions go to commenters Enna Isilee for predicting an 'x' in the name, and to jw for "Drakkar Noir" that one made me laugh out loud. Well played, jw! Good one Jed, how come your blog post for the night isn't up yet? Get busy! Hey, everyone, do yourself a favor, and click on Jed's name, he's got a blog called "Jed's Sketch Emporium" that he's posting to everyday, go check it out! I like Jed's blog (especially the Japan posts and pick a pup), thanks for tip! My son Rob will be so excited when he finds out he won yesterday! Thank you! Hmm . . . that's one burly guy you've got there. I'd say he looks like either a Thor or an Igor to me. The great horned dragons of the savanna look fierce, but used to be quite docile--preferring to fly off when provoked. This behavior didn't help them when it was discovered their wings could be made into enchanted cloaks. Rhinotar and his mate, Fostlor, began taking in stranded dragons and protecting them. Together the new family patrolled the vast plains--striking hunting parties and bringing back more stranded dragons. 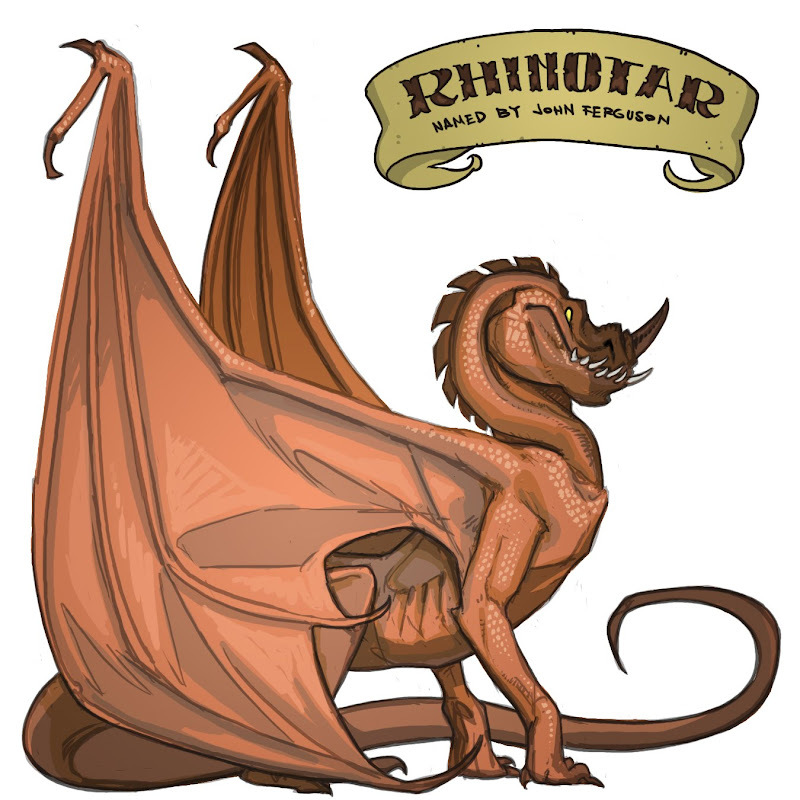 Today, Rhinotar rules a large community controlling hundreds of miles of savanna. Rhinotar is often called the King of the Plains and only the bravest (or stupidest) of adventurers attempts to hunt one of his family.